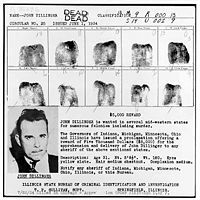 No, John Dillinger did not sleep in all these places, but rather this tour is based on the history book by Paul Maccabee John Dillinger Slept Here: A Crooks' Tour of Crime and Corruption in St. Paul 1920-1936 about Saint Paul's heyday as a haven for gangsters on the down low. The Eighteenth Amendment to the Constitution of the United States, known as the Prohibition Amendment (1920-1933), prohibited the manufacture, sale, transport, import, or export of alcoholic beverages. The mandated shutdown of breweries and distilleries ended the lawful production of alcoholic beverages and created a vacuum that was filled by the unlawful production, sale, and control of "bootlegged" products and lawless allied activities: smuggling, gambling, prostitution, extortion, robbery, and murder. These became the province of such powerful crime czars as Chicago's Al Capone, of criminal gangs, and of organized crime. Lawlessness and the corruption of officials and police — the unintended consequences of the legislation — infected many American cities, including St. Paul. The city became a center of operation and a haven for such notorious gangsters as John Dillinger, Babyface Nelson, Roger "the Terrible" Touhy, Machine Gun Kelly, Alvin "Creepy" Karpis, and the Barker gang, whose activities extended to robbing banks, holding up mail trucks and trains, and kidnapping and holding their hostages for ransom. Police Chief John O'Connor agreed not to prosecute the gangsters as long as they didn't commit crimes within the city, and as long as the owners of brothels and gambling houses made payoffs to O'Connor's collectors. For St. Paul, it was a win-win situation. The citizens were protected and the gangsters spent their money in the city. Everything went well, that is until a combination of factors including O'Connor's death and replacement by a more reform minded police chief, the murder of Dan Hogan, St. Paul's underworld czar who supervised the layover agreement, the Great Depression, and increasing pressure from the FBI under J. Edgar Hoover, caused the O'Connor System to come apart. This resulted in the broad daylight kidnapping of St. Paul brewery mogul William Hamm Jr., and banker Edward Bremer by members of the Barker-Karpis gang.